Be Part of the largest mass participation event in Wales! 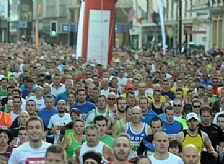 – The Lloyds Bank Cardiff Half Marathon 2014 is the largest mass participation event in Wales as well as the 2nd biggest half marathon in the UK. With a record-breaking 20,000 runners expected to take part in 2014 the Lloyds Bank Cardiff Half Marathon has fast become one of the premier races in the UK”s athletics calendar, a fact cemented by being awarded the IAAF World Half Marathon Championships in 2016. This year”s event hosts both the Welsh and British Championships and will feature world-class athletes for all over the world, in addition to the thousands of runners simply doing it for the love of running or to raise money for a wide range of charitable causes. But it”s more than just a race. As well as the main event on Sunday 5th October, the 2014 Lloyds Bank Cardiff Half Marathon also sees the return of the action-packed Festival of Running on Saturday 4th October. This event will see hundreds of children, young people, and families embracing the fun and excitement of the overarching Lloyds Bank Cardiff Half Marathon weekend – whether that”s through the Family Fun Run, the Mascot Race, 1-Mile Road Race, Come & Try Sports Activities, or the Music, Face Painting, Food, or other Entertainment, it”s sure to be a great weekend for all involved! Fitzalan High School are looking for Fitzalan pupils to be part of a Sports Leaders group to help manage the extra curricular sports programme in the school.